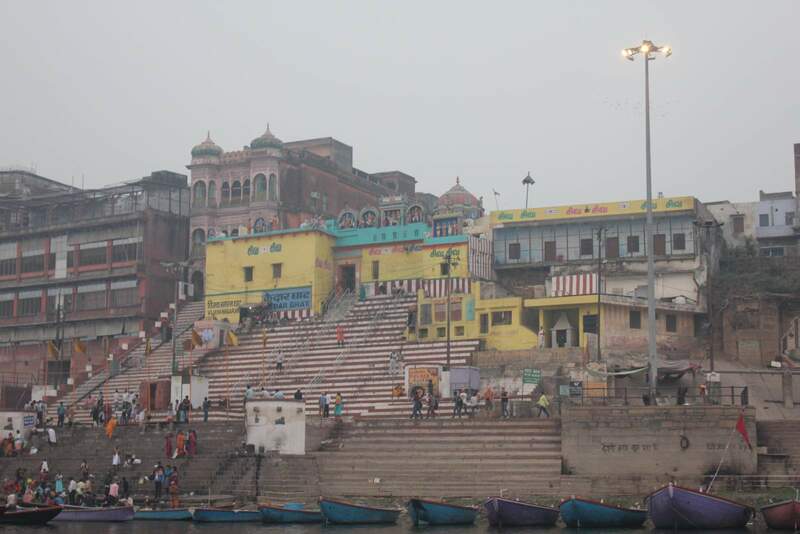 During our family trip to India, we have visited Varanasi. 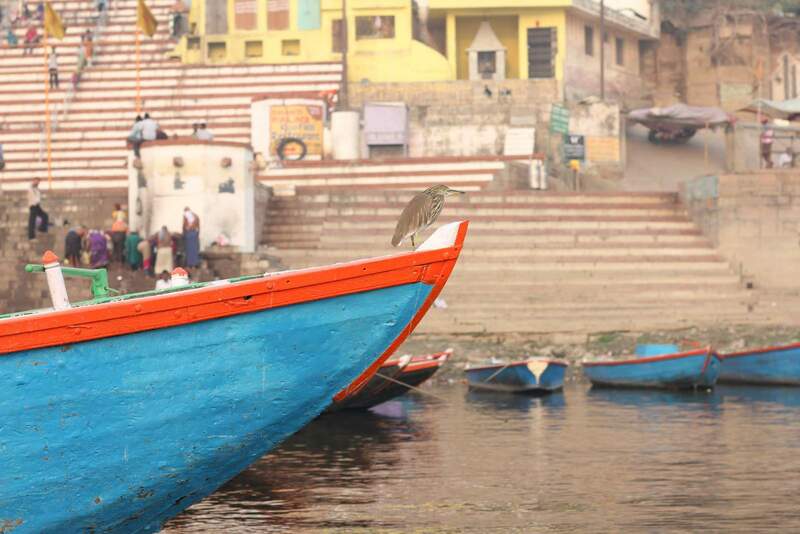 Here are loads of photos and a few words about our time in the Indian city of Varanasi. Here, we unexpectedly had a guide, as the driver didn’t speak much English. 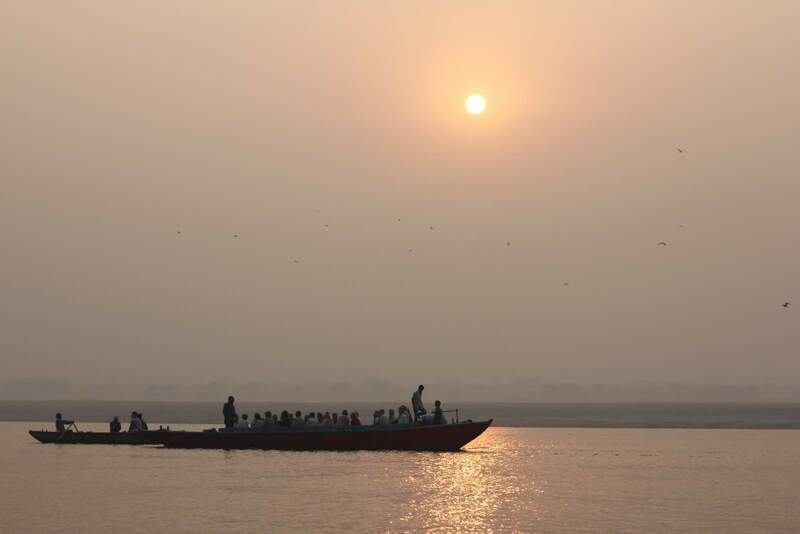 We’re glad we did since we wouldn’t have understood or learned as much as we did about Varanasi without the guide. 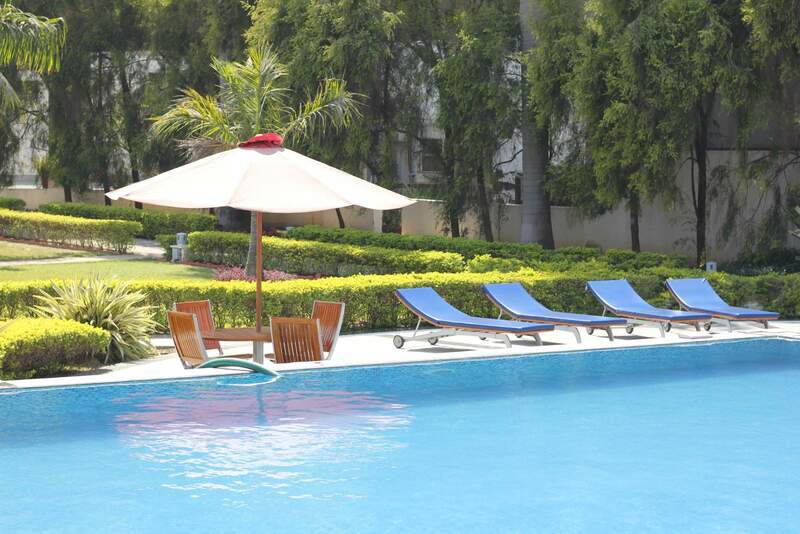 We started in Delhi – check out our postcard from Delhi here! 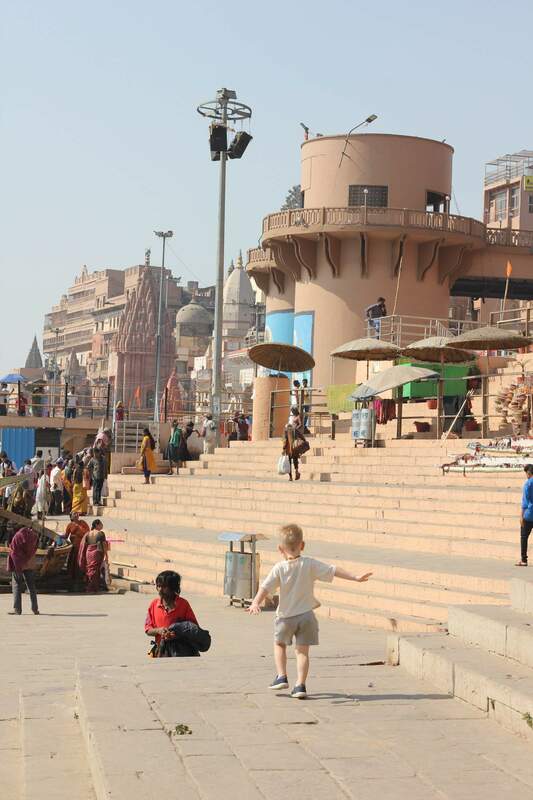 Before we left England, I’ll admit to having been really stressed about taking the kids to Varanasi. 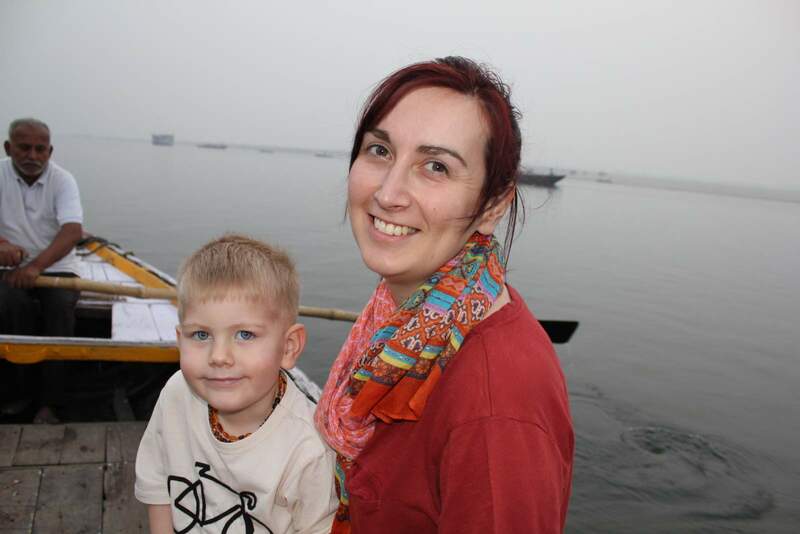 I especially wasn’t keen on taking them on a boat ride on the Ganges. I’d told Rob he could go by himself and I’d entertain the kids in the hotel. 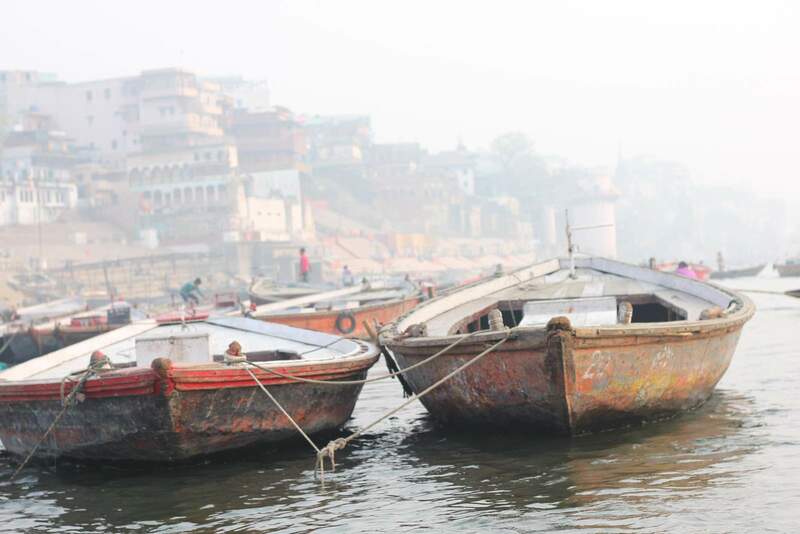 I’d made the mistake of Google Image searching Varanasi, and the sights were uncomfortable for an adult to see, let alone a 5 and a 3 year old. I was really hesitant to take the kids to such a place. 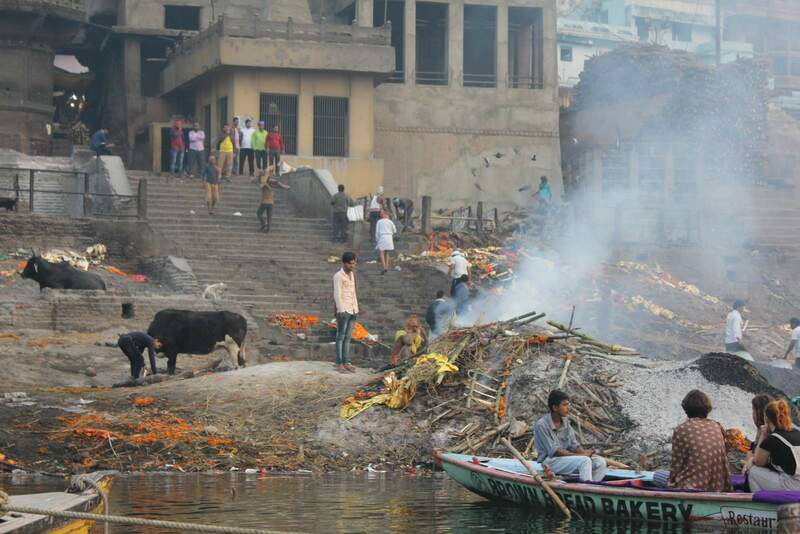 I don’t know if you’ve ever Google Image searched the Ganges in Varanasi, but the pictures are somewhat shocking, with dead bodies floating, decomposing, and indescribable filth. I didn’t really want to have to explain to the boys what we saw, if that was the case. 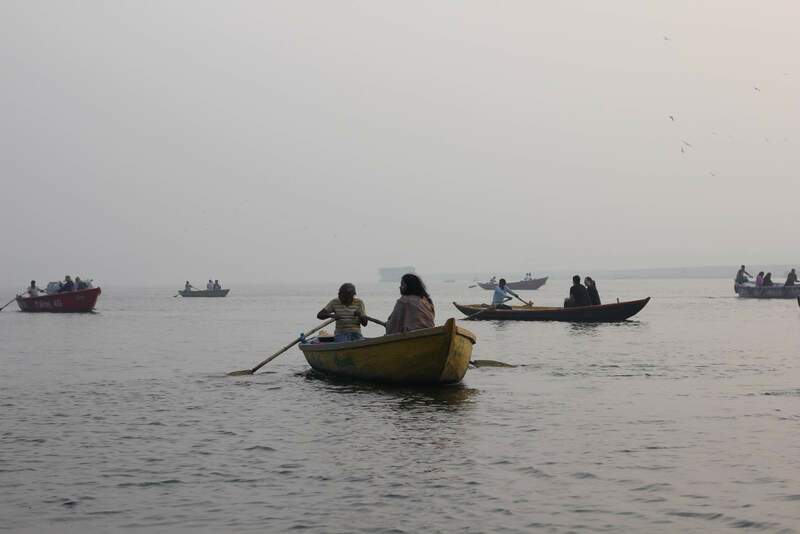 Anyway, it’s not like that, at least not when we visited Varanasi. It’s colourful, it’s beautiful, and full of life. 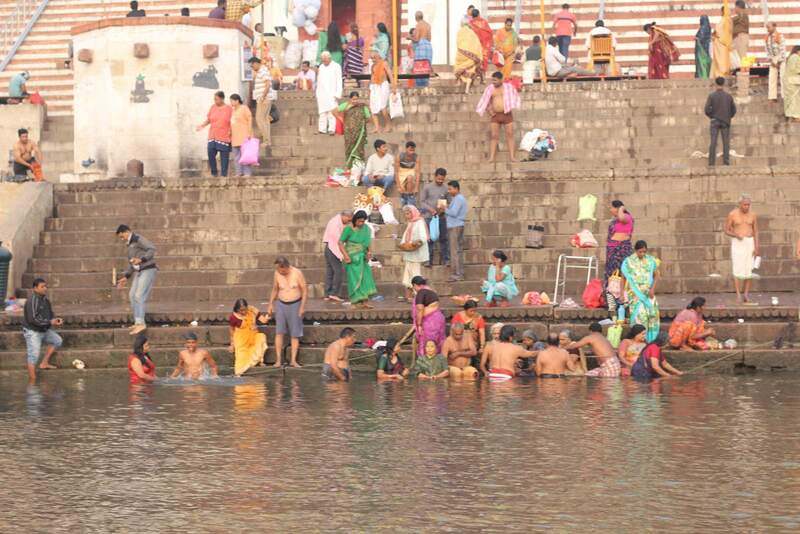 People washing, laughing, and purifying themselves. Yes, we did see dead bodies, but they were under shrouds or burning. 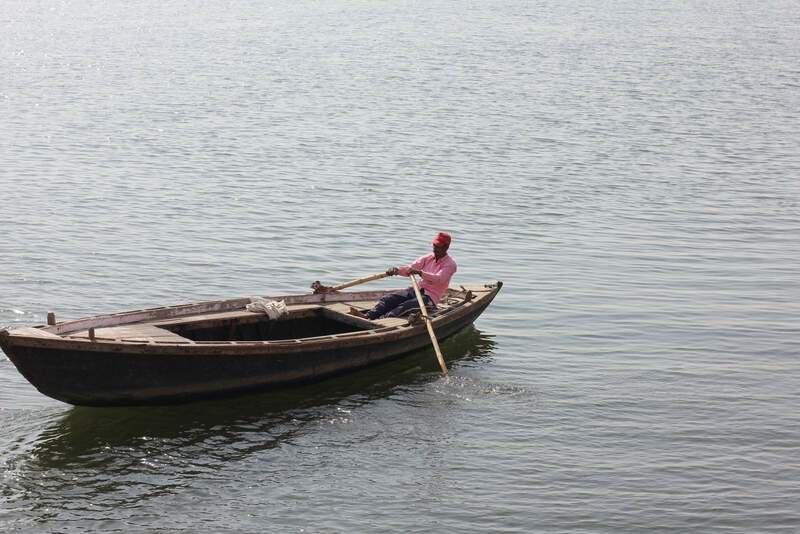 The overwhelming sense of the life along the river is that of cleansing – washing clothes, sheets, and people. 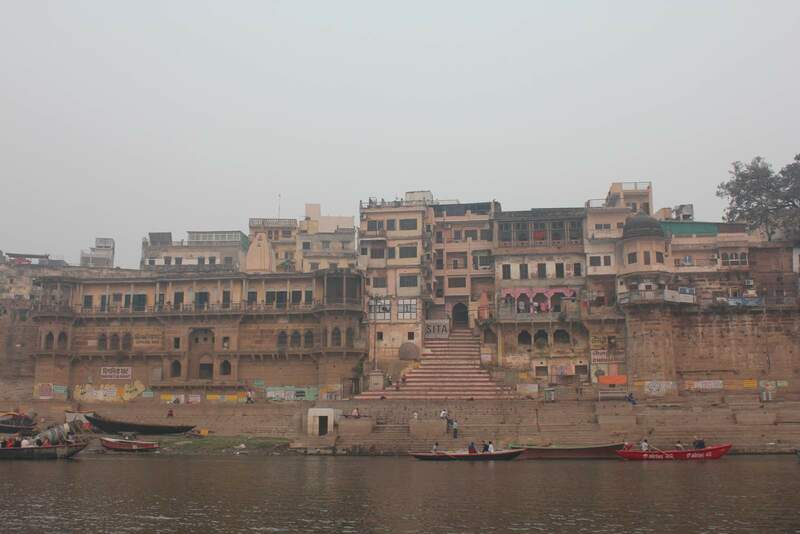 The buildings at the top of the ghats (steps) are often palaces, left behind by maharajas in the last century. 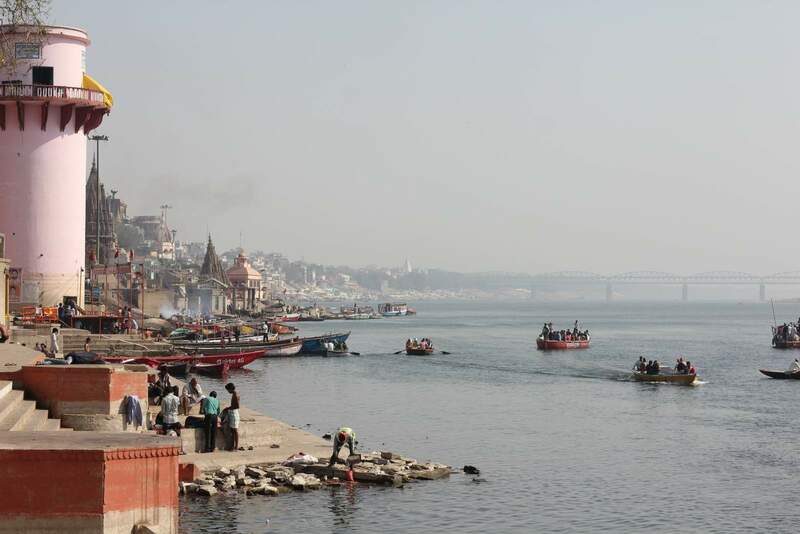 There are 88 ghats in Varanasi. 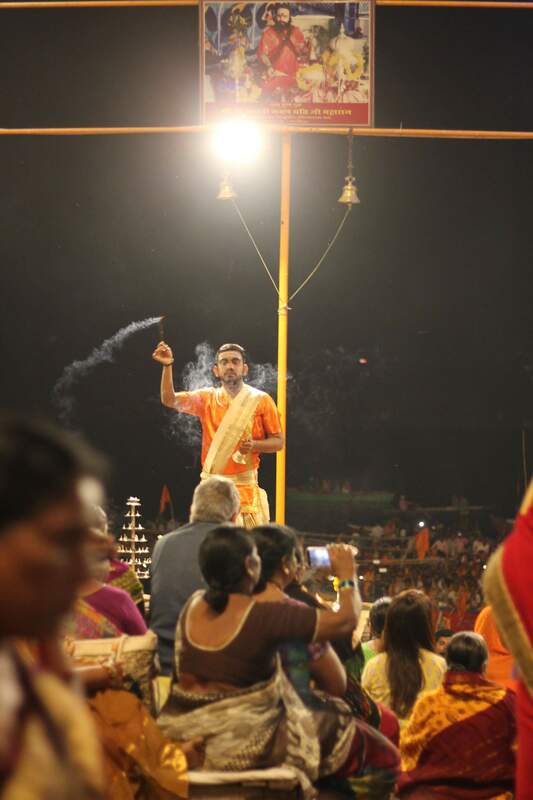 Most are used for cleansing or puja ceremonies, and two are used for cremation. 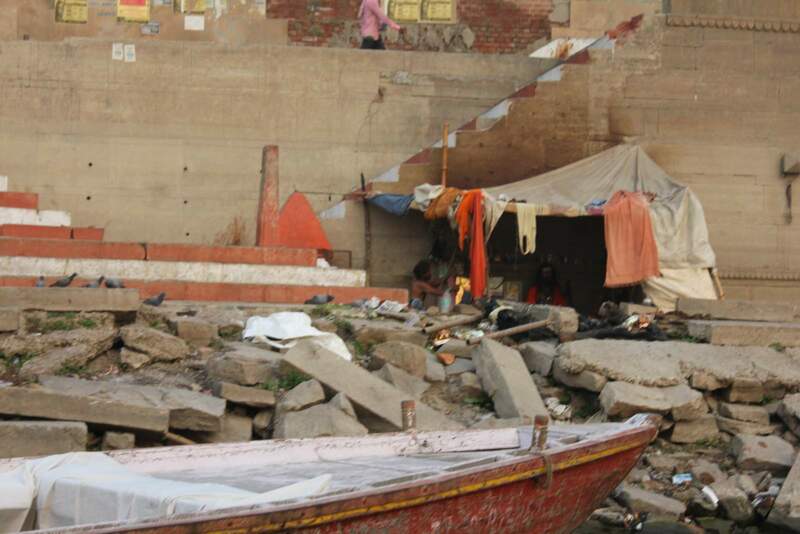 In the evening we walked along to the Dahashwamedh ghat. We got there early, and gained good seats front/middle on the steps. 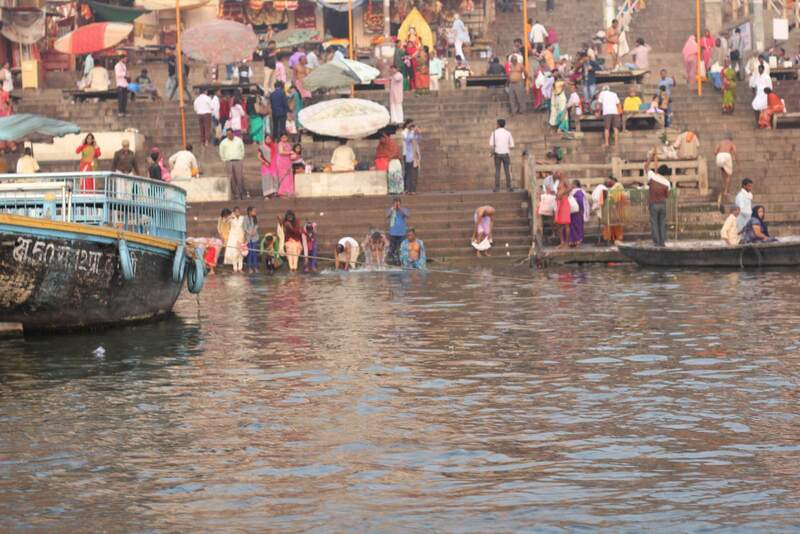 Every evening, (even during monsoon or high river) aarti is performed by priests on the Dashashwamedh ghat. 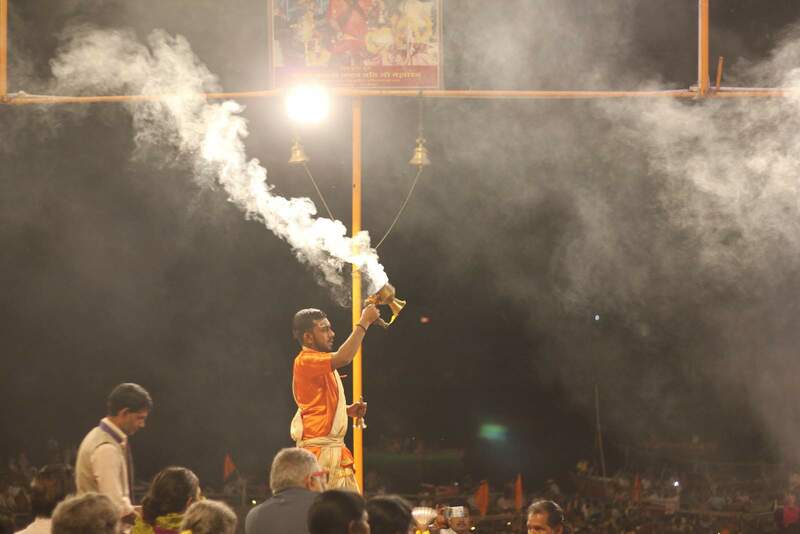 Through the aarti, Agni Pooja is performed in which a commitment is made to the Lord Shiva, Mata Gange, Surya, Agni (Fire) as well as the whole universe made by the Lord Shiva. 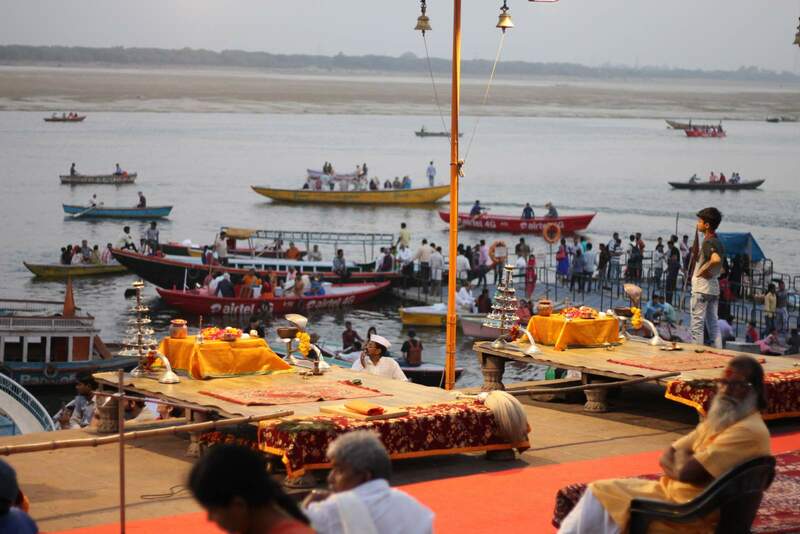 Five priests stand on little platforms, facing the river, and they wave brass lamps with fragrant smoke, candles or fire. 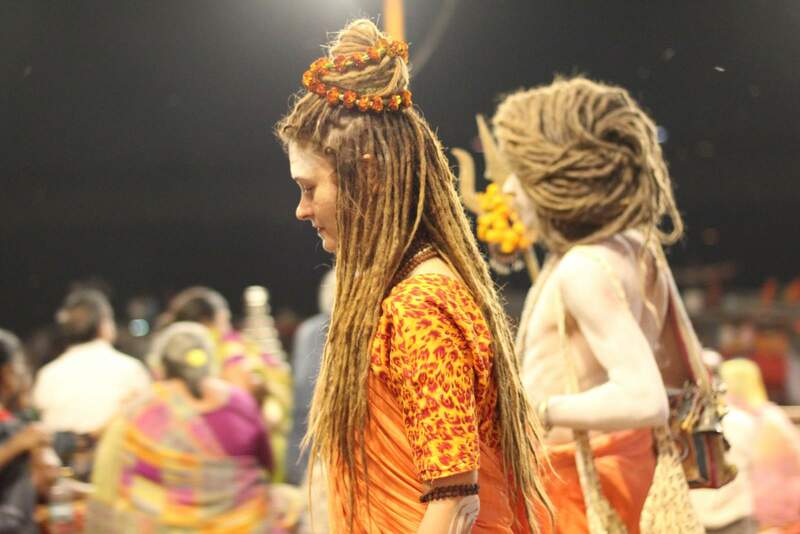 All the while they mantra chant in the presence of the huge crowd. It’s basically a party, but a spiritual one. 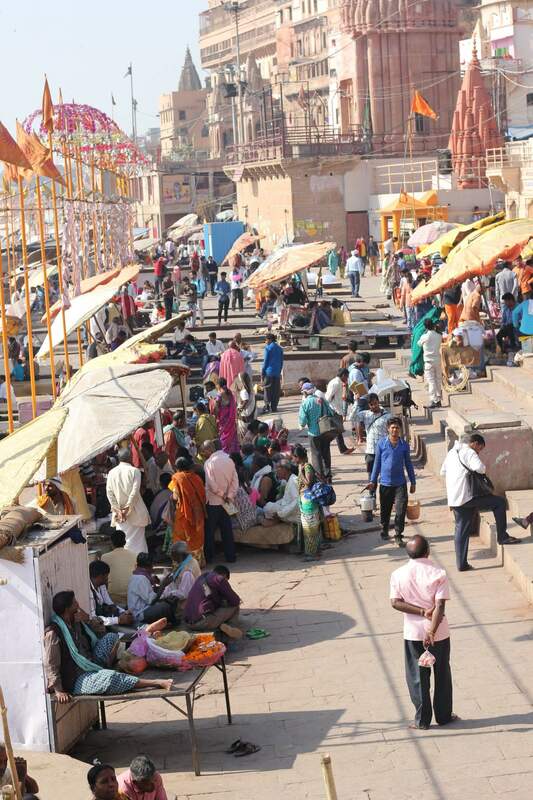 We visited two temples in Varanasi. The first was the Hindu temple of Shiva in the middle of the university. Here there was a bit of a party going on in the middle of the temple – no photographs allowed. Next we visited the Shri Durga Temple, which is a red building – the favourite colour of the goddess Durga – the goddess of strength and power. Here women used to visit to slaughter a goat, in hope that they would fall pregnant. Now they’re not allowed to kill a goat, and instead they pretend by painting themselves a little bit red. If they do have a child after asking Durga for one, they have to return to thank the goddess. I don’t know why, I can’t find any photos of these temples. The carvings are so intricate inside – it was good to step in and experience the sights and sounds, as well as the smells of the temples. We were shown the weaving going on in little tiny rooms in a few streets in Varanasi. 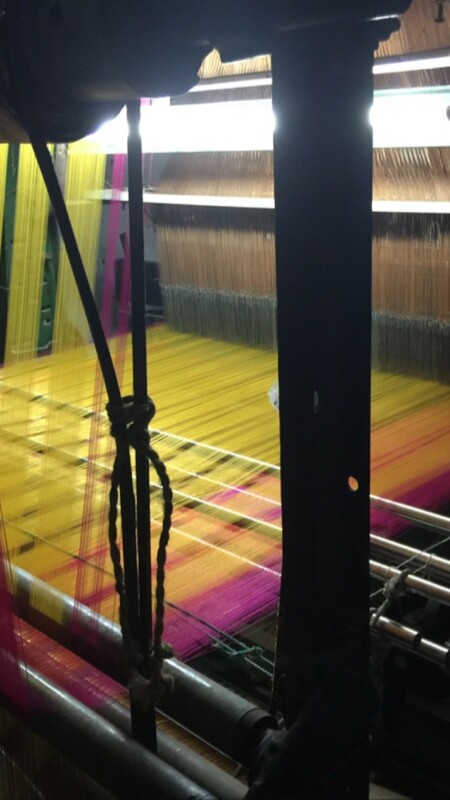 The sound of the looms was brilliant to hear; so noisy, even the manual looms were deafening! 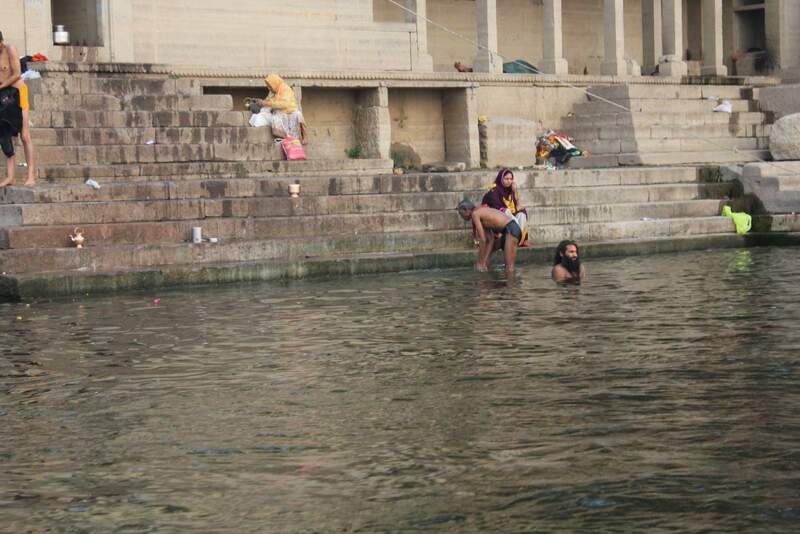 The next morning, James and I went swimming while Rob and Noah returned to the ghats for one last look. Our next stop is Amritsar. 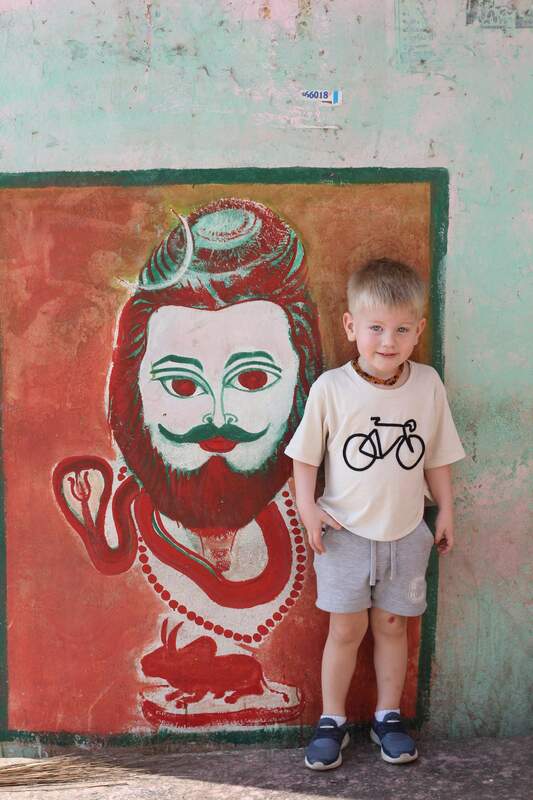 Check out our full itinerary of our holiday in India with our kids here. See more (yes, even more!) photos on Instagram.